The photo shows an ADF fitted to a GT20000 scanner the scanner is NOT included. 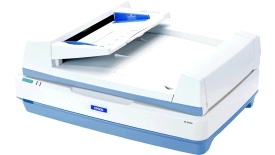 Give your business the extra flexibility of A3 scanning with the Epson GT-20000. It scans in mono or colour up to 600 x 1200 dpi so you can convert your larger originals into high quality digital files to print, share or archive. With standard TWAIN and ISIS driver support, it also fits easily into your office document management system. Transform office scanning with fast, high quality scanning on a big scale. From text to photos, make the most of all your originals with features including RGB dropout, auto-de-skew and text enhancement. Incorporate the scanner into your office document management system driver support and transfer data quickly with USB 2.0 and SCSI connection. Scan larger archives up to 23 ppm with the optional 100 page duplexing auto document feeder and use optional networking to share great scanning across your office. This unit is 'refurbished', all units are fully tested but may not be in the original box. RISC OS & Windows TWAIN drivers. Mac OS X, Windows Vista & 7 compatible. n.b. Unfortunately there is no RISC OS support for the ADF Automatic Document Feeder. This scanner can be used on a RiscPC etc. in conjunction with either a Simtec or Castle USB Podule and also on an Iyonix. If using a Castle USB podule please note that version 0.94 of the firmware is the only version known to be compatible. If you do not have this version, please get in touch with us and we can supply a flash update. Price: £185.00 no VAT to pay!